There are quite a few places across the country that are special to Blood:Water, and Holland, Mich. is definitely on that list. In many ways, the Blood:Water story began here when our co-founders, Jars of Clay, met Steve Garber at a forum hosted by Hope College. Since then, we’ve had the fortune of being a part of a few house concerts hosted by friends of Blood:Water in Holland. While house concerts have been great for engaging the community and raising needed support, the most exciting thing to see is people being moved and transitioning from a concert attendee to a Blood:Water community member that has become actively engaged in our story in Africa. A great example of this is Linda Dykert. Linda attended her first Blood:Water house concert a few years ago after being invited by a friend in Holland. She was able to hear about the way Blood:Water works in the communities and the transformation that takes place in the lives of those involved in Africa and the US. However, it wasn’t until after her second house concert in Holland that she felt the desire to join us in Africa and see the work. Linda called me and said she wanted to go deeper, beyond just making her annual donation. 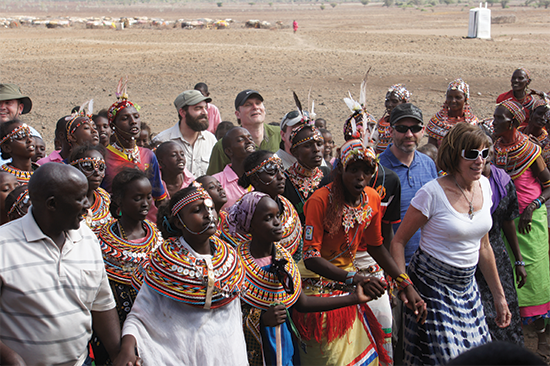 Linda joined our Vision Trip team to Africa in 2014, and she has been a huge part of the Blood:Water story ever since. Last week, at our most recent house concert at Fellowship Reformed Church in Holland, she joined me on stage to talk about how her life is now richer after traveling to Africa with us. She now knows the names and faces of those who we partner alongside to create lasting change. She’s seen firsthand how just simple acts here can help transform the lives of our friends in Africa. Linda continues to support Blood:Water in every way she can, including offering her time-off to work alongside us. That’s the story we love to tell. The story of people like Linda, who have chosen to dig deeper with us. For those who have been watching from the crowd, we invite you to join us and explore how you can become a bigger part of this amazing story! If you're interested in hosting a house concert, email me at jsmith@bloodwater.org.